There are two Joomla extensions available for migrating the data from Joomla 1.5 to Joomla 2.5 or 3.x, jUpgrade and SP Upgrade. This article will show instructions for both and you can choose which solution is better for you. jUpgrade is free, SP Upgrade is commercial. jUpgrade changes the IDs of Joomla categories which makes the upgrade process more difficult, while SP Upgrade retains the same IDs. jUpgrade must be installed on your Joomla 1.5 site and it will create Joomla 2.5 site for you with Joomla 1.5 data. 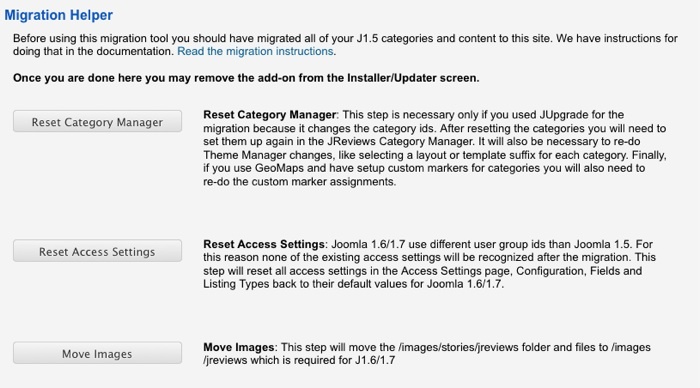 SP Upgrade must be installed on exiting Joomla 2.5 or 3.x site and you can use it to migrate the data from Joomla 1.5 site. These instructions will show you how to migrate Joomla core data and JReviews data to Joomla 2.5. For data migration of other Joomla extensions that you have on your Joomla 1.5 site, refer to their documentation for instructions. It is a good idea to backup the database before proceeding with the migration. If your Joomla 1.5 site uses JReviews 2.3 or older, you must upgrade to JReviews 2.4.9.1 before you can do the Joomla migration. The download package for JReviews 2.4.9.1 is available in the Client Area. Read how to upgrade to JReviews 2.4 from earlier versions. Install jUpgrade extension (com_jupgrade-2.5.2.zip) on your Joomla 1.5 site using Joomla installer. Click on "Start upgrade" button. jUpgrade will then download the latest Joomla 2.5 release, install it and migrate all Joomla core data. The new site will be located inside the /jupgrade subfolder of your main site and it will use the same database, but with a different table prefix (j25_ instead of jos_). Next step is to transfer JReviews database tables for the new site (that needs to be done before installing JReviews on Joomla 2.5). Since the new site is installed in the same database, you could just rename all jos_jreviews_ tables to j25_jreviews_, but it is safer to create copies of the tables. To do that, go to phpMyAdmin, select the database you are using and click on the Export tab. 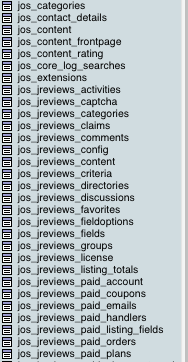 Select all jos_jreviews_ tables and export them into .sql file. Now you can install JReviews on the Joomla 2.5 site, but it must be the same version that was installed on the Joomla 1.5 site - JReviews 2.4.9.1. Read Installing JReviews. Click on the Reset Category Manager button. Then go to JReviews Categories Manager and setup categories again. Make sure you read Using JReviews with unlimited levels of categories. Click on Reset Access Settings button. After that, you can adjust Access Settings how you want. Click on Move Images button. Old JReviews menu items will no longer work, we need to edit them and configure again. Your Joomla 2.5 site should now have all your JReviews data from the old Joomla 1.5 site. Now you can upgrade JReviews to the latest available v2.4 release. If you want to upgrade Joomla from 2.5 to latest 3.x, this can be done using the Joomla Update component. If your Joomla 1.5 site uses JReviews 2.3 or older, you must upgrade to JReviews 2.4.9.1 before you can do the Joomla migration. The download package for JReviews 2.4.9.1 is available in the Client Area. Read. how to upgrade to JReviews 2.4 from earlier versions. Download the latest version of Joomla 2.5 or 3.x and install it in a new database. During the installation, Joomla will suggest a randomly generated database table prefix (i.e. hx31_), but you should change that to jos_ to make the migration process easier. Important: don't install the sample data. After the installation is completed, login to the Joomla Administration, go to Extensions Manager and install SP Upgrade extension. After SP Upgrade is installed, it will ask you to enter Joomla 1.5 database information and to select the data you want to migrate. Select everything you want and click the Migrate button. Next step is to transfer JReviews database tables from the old site's database to the new database (that needs to be done before installing JReviews on the new Joomla installation). Go to phpMyAdmin, select your Joomla 1.5 database and click on the Export tab. 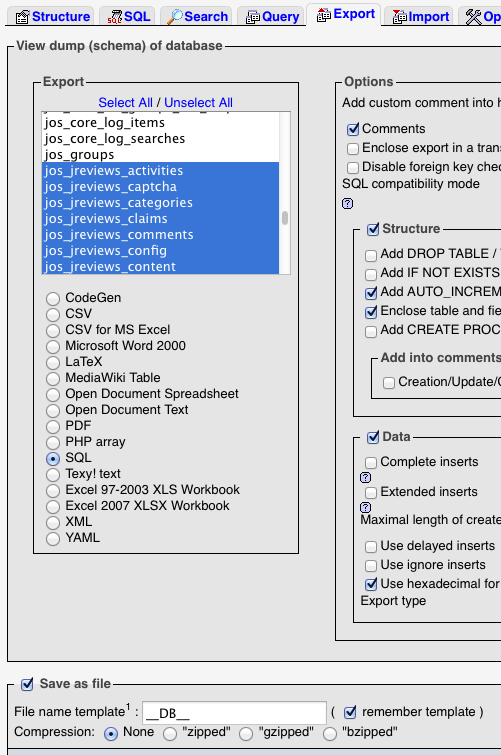 Select all jos_jreviews_ tables and export them into .sql file. With SP Upgrade it is not necessary to click on Reset Category Manager button, just go to the JReviews Categories Manager and setup your ex Sections which are now categories. For those categories select "This category will not have listings" instead of a listing type. Read Using JReviews with unlimited levels of categories for more details. 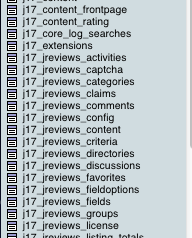 Your Joomla 2.5/3.x site should now have all your JReviews data from the old Joomla 1.5 site.